What an exciting holiday it is shaping up to be for the Chimney Rock Gem Mine and Greenville Gem Mine! First we are over the moon to announce that our updated website has arrived and it has an ON-LINE STORE! Secondly, Our Annual 12 Days of Christmas Sale begins this Saturday, December 9th. We have so many giveaways, great deals and more planned for you this year we cannot wait! Each year this annual holiday event seems to get bigger and better. Once again we’ll announce each days “Item of the Day” via a Facebook Live Post at 10 am. This year we will again split our live broadcast between our Chimney Rock and Greenville locations. The great news is that the item of the day will also go on “live” our Online Store that same day. 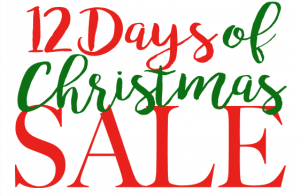 Not only will it be 12 Days of great sales but 12 days of GIVEAWAYS! Each one of our three locations will have a daily special giveaway; Sterling Silver Jewelry, Amethyst, Fossils, and more! Registration is easy too. Each customer will receive a ticket for the days drawing along with their receipt. Each store will announce the winner of the day on facebook each evening after we close. All of this is leading up to our BIGGEST Sales Event of the Year – which begins December 20th and last until Christmas Eve. Take the Gem Mine with you wherever you go! Bring the joy of Gem Mining home today! It’s the perfect gift for that “Rockhound” in your life. Each Miner Kit comes with your own sifter, shovel and gem chart. Best of all we guarantee a find every time! Our To Go Miner Kits Make a Great Gift!Our new look has been the result of years of planning. We cannot thank the folks at AppNet for all their hard work. We wanted a more user friendly and interactive website for our patrons. We wanted our website to be a way to always have the gem mine at your fingertips. To stay up to date on special events in the area and at our gem mine. To always have our gem guide to go to when you need help identifying your stones. To make planning your next gem mine birthday party or school/group trip easy to book. More importantly, we had to have an Online Store. Our new Online Store will be a place to find our Miner Kits, Gift Sets along with various Sterling Silver Jewelry and more. So we hope you will check our online store often! This Saturday we will be broadcasting live from both Chimney Rock (at 9:30 am) and Greenville (at 10 am). So don’t forget to like the Chimney Rock Gem Mine and Greenville Gem Mine on Facebook to catch our 12 Days of Christmas Item of the Day announcement December 9th thru December 20th. 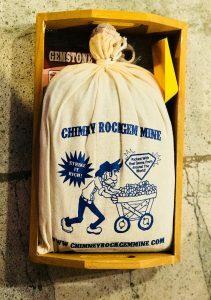 In the meantime we hope you will browse the new and improved Chimney Rock Gem Mine and Greenville Gem Mine websites. We will be updating our new sites regularly so be sure you check back often!